Time for another Little Passports update! A year ago, Trevor and I started an album about his travels within the United States. There are 50 pages in the album; each page consists of the Little Passports postcard, a photo of Trevor's first visit to that state, and journaling about the visit. You can see the first completed pages (Washington and Hawaii) here, the next set of completed pages (Florida, Massachusetts, New York and New Jersey) here and the most recent set (California and Alaska) here. Today, I'm sharing four more completed pages from his album. First, Oregon. Trevor visited Oregon for the first time when he was 4. 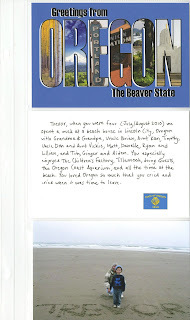 We've had the photo and the journaling card in the page from the time we started the album, just waiting for the Oregon postcard to show up. We traveled quite a bit this past summer. Our first trip was to Colorado, where we tasted celery-flavored soda and had our 2nd Annual Cookie Bake-off (among other things). 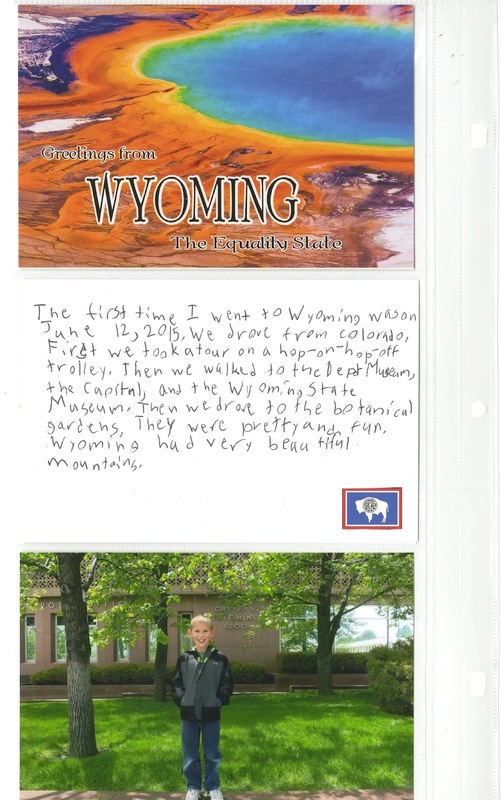 On the same trip, we visited Wyoming. 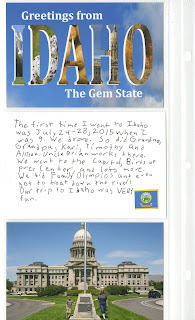 Our final trip of the summer was to Idaho, where my brother-in-law is now working. Tomorrow I'll tell you about the Family Olympics that we held during the trip. 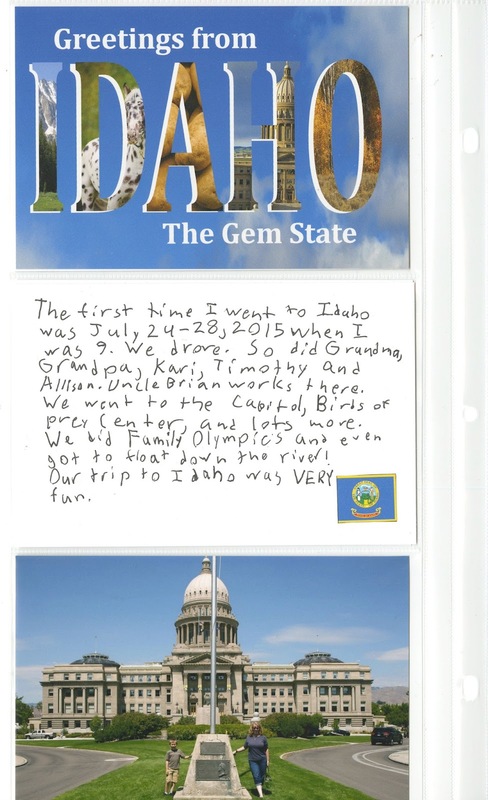 There are two more states that Trevor has visited that haven't been part of his Little Passports subscription yet, Maine and Nevada. Once those arrive, I'll share those finished pages. Since beginning my 43 New-to-Me project, I am drawn to ethnic grocery stores like a moth to light. 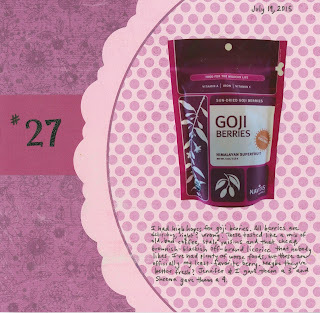 I love browsing the aisles in search of things I've never tried (and often, never even knew existed). I often find myself buying something with no idea how to consume it. Such was the case with iris water. 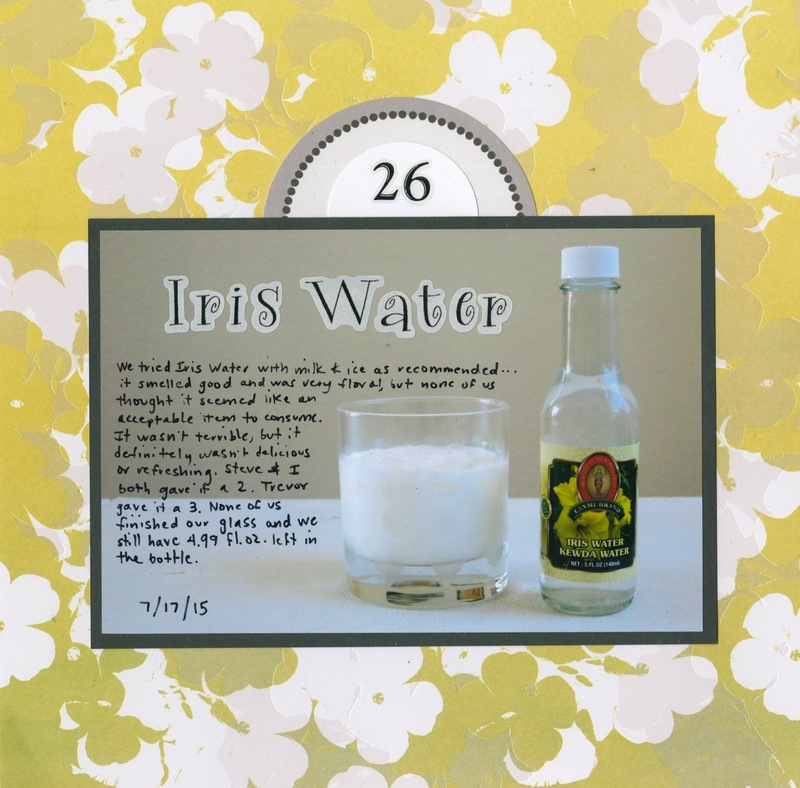 I'm familiar with rose water and have had it in multiple things, but I had to do some research after buying the iris water. I learned that Punjabis add iris water, sugar and ice to milk for a refreshing summer cooler. So that's what I did. 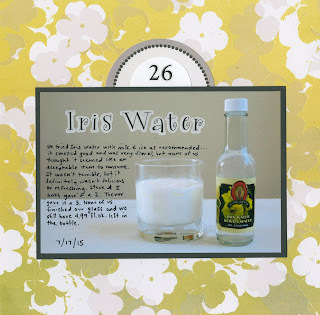 The iris water smelled fantastic as I was adding it to the milk... but in a "that perfume smells great" way and not in a "that makes me want to eat" way. Still, it seemed promising. Alas, no. I like ice cold milk, especially sweetened, but a few drops of iris water were enough to turn the milk into something I didn't want to drink. Bummer. Steve and I both rated the iris water a 2. Trevor gave it a 3. We still have 4.99 fl. oz. left from the 5 oz. bottle, so expect me to offer you some iris water to try if you ever come by our house. It's been over a month since I shared my latest new-to-me food, so now it's time to catch up on the backlog. 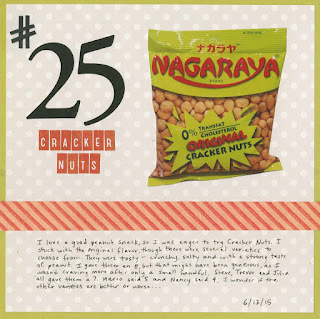 New-to-Me food #25 was Cracker Nuts (original flavor). I liked Cracker Nuts a lot. They were crunchy and salty with a strong peanut flavor. I rated them an 8, though in retrospect I think that was a bit high. The half-eaten bag is still here two months later, which is not true of anything else that I rated an 8. My co-tasters rated the Cracker Nuts 7 (Steve, Trevor and Julia), 5 (Marco) and 4 (Nancy). I'm really tempted to try the Adobo flavor. Has anybody had them? Trevor and I were at Costco the other day when we saw a bag of six large avocados for $5. They are usually $2 each at the grocery store, so this was quite a bargain! Steve was on a business trip, so I did hesitate for a moment before buying them, wondering if just Trevor and I could eat six ripe avocados before they went bad. But we were up for the challenge. I harvested the very last of the tomatoes from our garden and chopped them up with a little bit of basil. I diced fresh mozzarella and made some sourdough croutons. I mixed it all with a little salt, pepper, olive oil and balsamic vinegar and spooned the mixture over a halved and peeled avocado. It was really good, a perfect light summer dinner. I've been scouring the internet for other stuffed avocado recipes and have pinned a few that look particularly fabulous. How do you like to serve avocados? I'd love some suggestions! 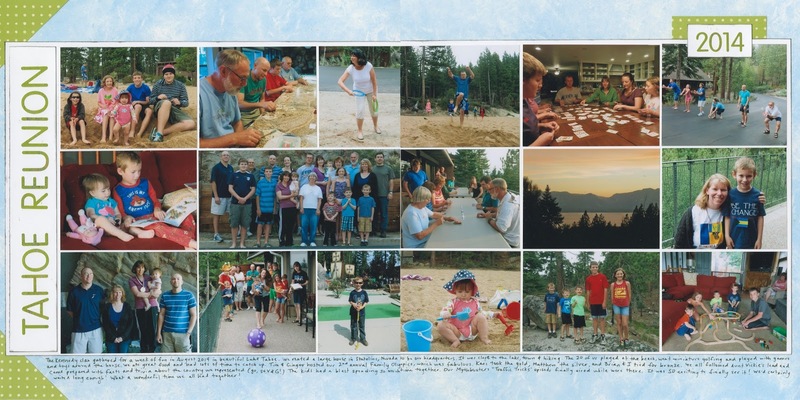 Last summer, we joined my extended family for a reunion at Lake Tahoe. It was awesome. I blogged about the trip and our Family Olympics competition right after we got home, but I didn't finish the layout until a few weeks ago. It's always a challenge for me to condense a huge trip with tons of photos into one spread. In this case, I made sure to include at least one photo from each different activity (Family Olympics, beach, mini golf, hiking, card games, etc). I focused mostly on the kids since they change so much from year to year, but I also made sure each of the adults were in the photos too. I left out all but one of the strictly scenic photos, as the backgrounds behind us showed our environment. I'm happy with how it turned out. Trevor has been taking ice skating lessons once a week for a little over five months now. The way the lessons are set up is brilliant. The first five skill levels are taught during the same hour on different parts of the rink. Each student wears a badge with the skills for their level. When they master a skill, they get a star sticker. When their badge is full, they move immediately to another teacher on another part of the rink to get their new badge. Because new students can start at any time and move up to a different level at any time, the class numbers are always in flux. The students do a recital every 10th week, with each class performing one piece. Trevor leveled up for the first time during the 8th week of this term, so rather than learn a new (harder) routine in one week and perform it the next, he dropped down to his previous level to perform the routine he'd been working on. And as it turned out, he and his friend Devin were the only skaters for that routine! Here they are with their instructor, William, performing Surfin' Safari. Trevor is in blue. C: I bet they do new themes every time. S: But coming up with five songs each time without ever repeating a theme? Seems hard. C: It's doable. Maybe. What's your guess about this session's theme? Quick, before they announce it! S: Halloween? Like Monster Mash and Thriller. C: Fun! But probably not. The next performance is at the beginning of October, which is early for Halloween. C: Good one! Beatles? Wizard of Oz! Maybe Country. You know what would be fun? Prison! S: Prison?! Can you name five child-appropriate prison songs?! C: Sure! Jailhouse Rock. Folsom Prison Blues. Umm.... I Shot the Sheriff? S: That's three. And I'm not sure they're child-appropriate. C: OK, maybe no Prison theme... but this is a fun challenge! 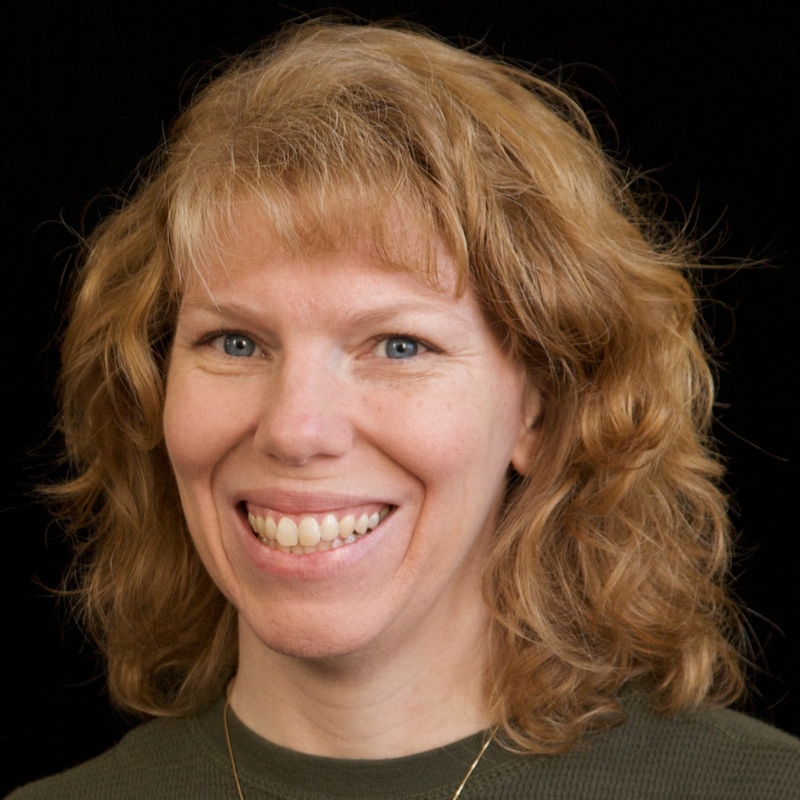 S: Name five kid-appropriate songs for a theme that may not seem child-friendly? It's been two weeks and my brain is obsessed with thinking up categories and songs. No matter how hard I try, I can't stop! So now I challenge you. Can you name five songs to fit a child-friendly theme? Any guesses about what this term's theme actually is? Back in June, each of the Cub Scouts bridged from one rank to the next. 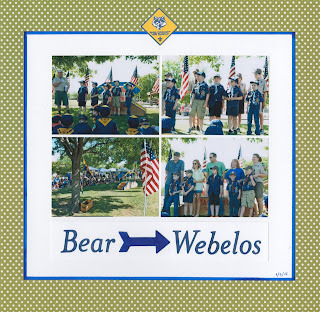 For Trevor and the rest of Den 1, that meant moving from Bear (3rd grade) to Webelos (4th grade). It's an important transition. 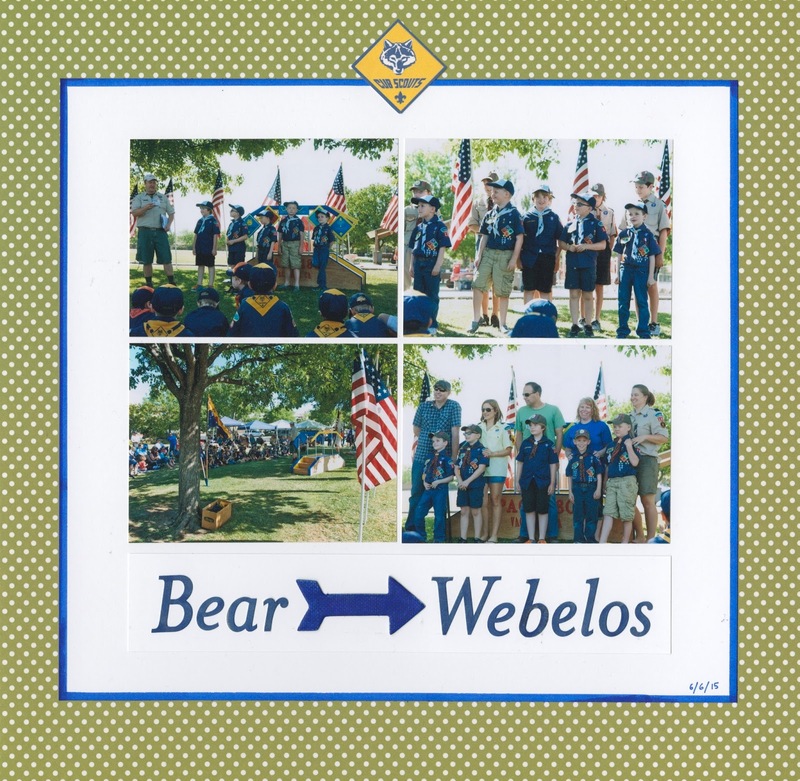 Webelos (which, by the way, is an acronym for We'll Be Loyal Scouts) is a 2-year program that prepares the Cubs to enter Boy Scouts. The program is much more rigorous and emphasizes outdoor skills more heavily than the previous years of Cub Scouting. 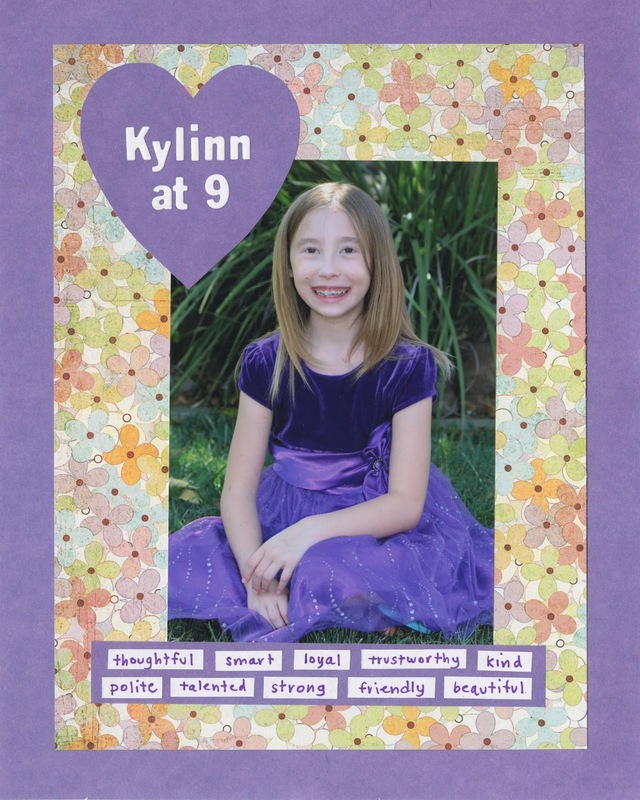 Some fun facts about this layout: I added the blue border on the white cardstock using a fat marker. I used the same marker to change the letter stickers from a pale blue to the darker blue while they were still on the sticker sheet. The arrow was plain chipboard, also colored with the blue marker. Before adhering the arrow, I peeled it apart to reduce its thickness by half. (I don't like bulk in my scrapbooks.) I saved the bottom portion for a future project and adhered the colored top to the page. 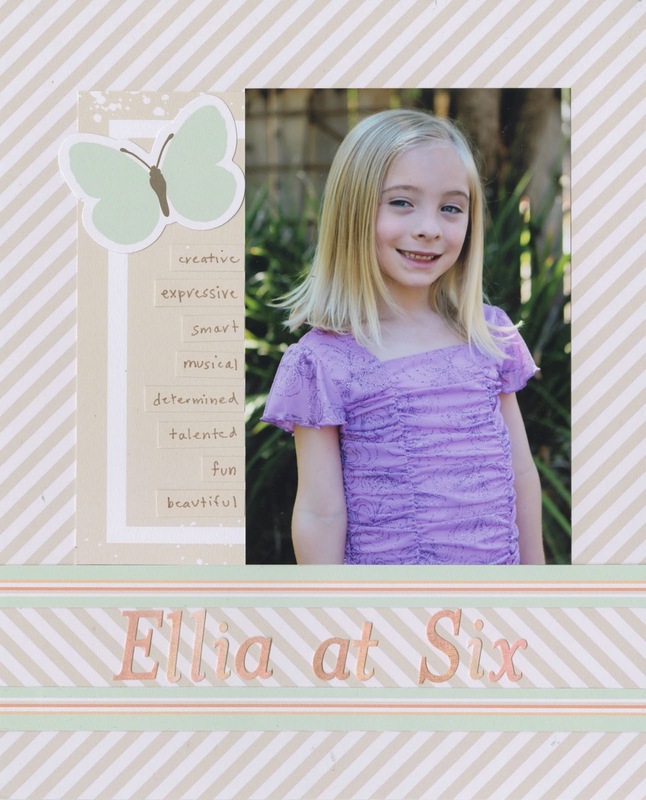 Here is the layout I made for my goddaughter Ellia's sixth birthday. It's an annual tradition. I love how it turned out, although it was quite different than I intended! I'd chosen the floral side of this two-sided paper by Chickaniddy Crafts as the background, with a strip of the stripe as a title. It looked really good, so I took it all apart and glued it. 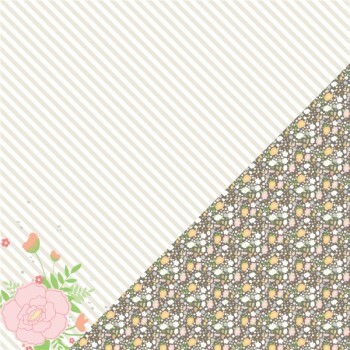 Somehow, I glued the background paper on upside down, with the stripes showing instead of the floral. I was really mad at myself. I *hate* when a project looks just the way I want it and I have to take it apart to add adhesive and hope I put it back together correctly. It's my absolute least favorite part of scrapbooking. But then I decided that the stripes looked pretty cool and that Ellia's photo pops against the really light background. She loved it, which is all I really care about. Hello! This is Trevor. Welcome back to Project CAT. Project CAT has ended and I am announcing the winners. Thank you to everybody who has entered! You all did great! The random winner is ..... Cierra! The winner that I chose is.... Joey! I chose Joey's Name Art because it was very creative of what things he used. All of them were ocean-themed. Congratulations Cierra and Joey! I'll get your prizes to you soon. Thanks again for entering, everyone! Check back here once in a while because I want to do a winter challenge next! Hello! Welcome to the last day of Project CAT! It is Trevor again. We're ending Project CAT with two of my favorite summer things... going to the fair and food! Step 1: If you don't have self-rising flour, make some. (It's just flour, salt and baking powder.) Use it to make puffy paint. We used the recipe from Happy Hooligans. Step 2: Use the q-tip to spread the puffy paint on a piece of paper (we used index cards). Make a design like a sno-cone, cotton candy, ice cream, or donut. You can decorate them with real sprinkles! Step 3: Put the artwork in the microwave for 30 seconds. Here are some samples of what it looks like before and after. ...you can peel the foods off the paper! After you peel them off the paper, you can use the paper to make cones. Now it's your turn! Make puffy paint fair foods or something inspired by my craft for a chance to win. Remember, Project CAT ends on Sunday at 12:00 Pacific. I will be back on Monday to announce the winners. Good luck! I love all of your entries so far! Step 1: Trace your feet on a piece of craft foam. Step 2: Cut out a a big area around the traced feet. Do not cut them apart yet. Do not cut on the lines, either! Step 3: Turn the craft foam over so that the traced feet are on the bottom. Using the stamps and ink pads, stamp the foam. Use a piece of scratch paper or foam to stamp off of the shoes so that the pattern continues off the edge. Step 4: Cut out the flip flops when the ink is dry. Step 5: Cut three slits on the bottom of the flip flop. One goes at the toe end and two go near the back on the sides. Each slit should be about 1" thick. Step 6: Cut four strips of foam using scissors. Insert two into the toe hole of each flip flop. Step 7: Insert the other end of the strips into the back holes. Glue them in place and let them dry. Step 8: Cut the extra ends of the strips off so that the flip flop is flat on the bottom. Glue the flip flops to the sand-colored paper (hot glue is easiest). Done! Now it's your turn! Make flip flops or something inspired by my flip flops for a chance to win! But first, we made some real pie! Step 1: Cut a brown strip of paper to make a table, then glue it onto the blue piece of paper. Step 2: Cut the silver paper into a pie pan shape. Use the embossing tool and ruler to make vertical dents in the pie pan to make it look more like a pie pan. Step 3: Rub black ink on it to make it look even more like a pie pan. Step 4: Cut orange paper into a dome that fits the pie pan. Then, cut light brown paper into skinny strips to make the pie crust. Color them with the brown pencil. Step 5: Layer the strips over the orange paper in a lattice style. Each strip should go over-under-over-under each other. Step 6: Put glue under each strip and put them back down. Use the scissors to cut any extra off. Step 7: Glue everything in place. Put the pie pan on the brown paper and put the orange paper right above the pie pan. Step 8: Peel apart a cotton ball to make a cotton ball whisp. This will be steam. Glue the whisp to the blue paper. Your pie is completed! Now it's your turn! Make my pie or a pie inspired by my pie for a chance to win. You have until Sunday, August 16 at noon Pacific. Hello! Welcome back to Project CAT! Trevor again. Today we are making a WORKING ferris wheel! It is very cool but it is one of the most difficult crafts I have ever made. You can follow my directions to make a difficult ferris wheel that works, or you can make a simpler version without all of the brads. Step 1: Using your circular object, trace around and inside it and cut that out to make the large circle of the ferris wheel. Step 2: Cut 3 strips of paper to make the base of the ferris wheel (that holds it up) and 4 long and skinny strips to make the spokes of the wheel. Step 3: Punch a hole in the center of each spoke. Put them each onto the large brad. Then glue the spokes to the large circle. Step 4: Poke a hole in the center of the blue paper. Put your ferris wheel brad in the hole. Now your ferris wheel spins! If you want to, you can skip the brad and your ferris wheel will not spin. It will be much easier to make. If you do this, you should probably skip all of the brads in later steps because it will just get harder. Step 5: Make four carts (seats) using 2" x 3" rectangles. Fold the sides and the bottom 1/2" and snip a tiny bit along the bottom for 1/2" to make a tab for gluing. Step 6: Glue the outside of the tab and attach the other tabs to that to make a cart. Step 7: Make riders for your ferris wheel using construction paper or cardstock. Glue them to the carts. Step 8: Poke holes in four of the spokes to hold the carts. Poke holes in four 3" cardstock strips too. Fold up 1/2" of each end of the strips. Put the brads in each strip to connect the strips to the ferris wheel. Step 9: Attach the carts to the strips by gluing them on the strips. Hold them in place for a few minutes to let the glue dry. Done! A bunny in the ferris wheel?! Now it's your turn! Create a ferris wheel like mine or something inspired by this ferris wheel for a chance to win! The last day to enter is Sunday, August 16 at noon Pacific.